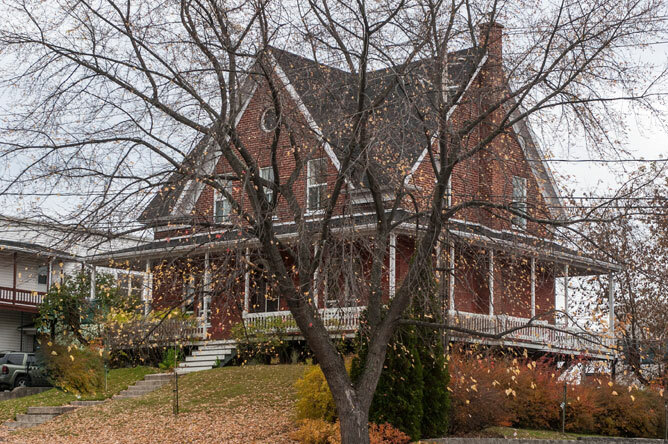 The Saint-Grégoire sector of the town of Bécancour takes great pride in its Acadian roots. Visitors arriving via Laviolette Bridge are greeted by an enormous Acadian flag flying from a hundred-foot tall flagpole. Smaller reproductions of the flag can be found all over the town. Many of the street names also honour the Acadians. In 1758, a group of Acadians settled in the Bécancour region, along the banks of Lake Saint-Paul. In 1764, a second group settled in what would become the village of Saint-Grégoire. The third group, made up of Acadians deported from New England, arrived in 1767. They made their home in the present-day location of the Boulevard des Acadiens. 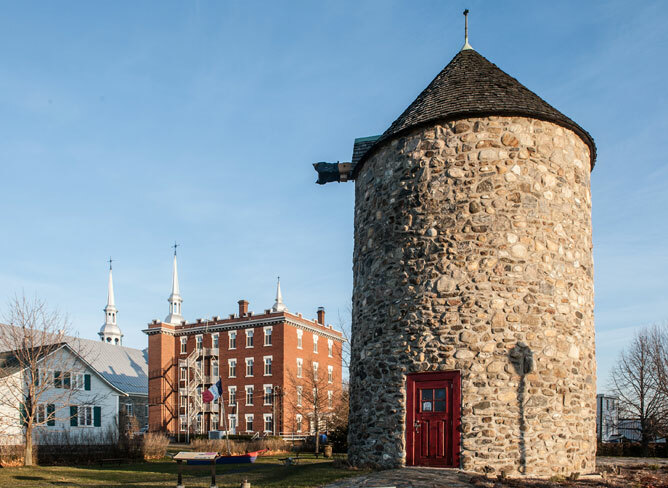 In 1988, a committee of citizens fought to conserve a historic windmill built in 1808. Five years later, they decided to rebuild the mill, using the original stones, in another location near the parish church. In 2007, the reconstructed mill became an interpretive centre dedicated to Acadian culture. It covers Acadian history from 1534 to 1857, while shining a spotlight on the main families that founded Saint-Grégoire. 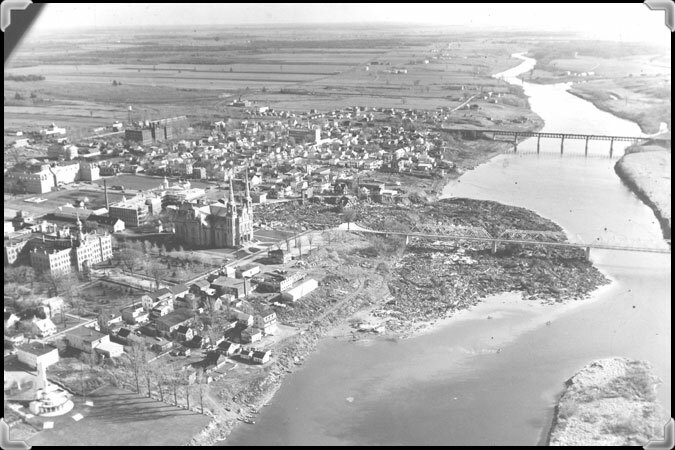 The Société acadienne Port-Royal organizes, presents and promotes the Acadian heritage of the Bécancour region. 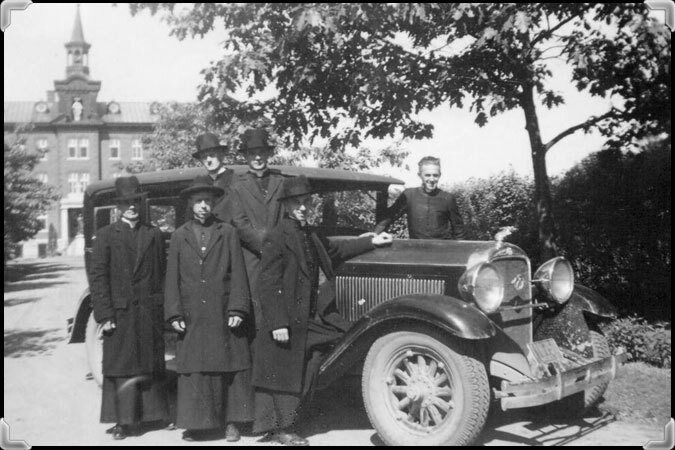 In 1925, the Montfortian Fathers opened a house in Nicolet. It was a place of prayer and reflection on the presence of God, as well as a cloistered retreat. Today, the building is home to a hotel estate but retains a humanitarian side, housing the families of sick children. Photograph showing the departure of Roméo Sylvestre in front of the Sainte-Marie Novitiate of the Montfortian Fathers in Nicolet, 1937. From left to right: Alfred Leblanc, Roméo Sylvestre, Maurice Desfossés, Georges-Émile Picard, Jean-Marie Martel and Joseph-Antoine Letendre. 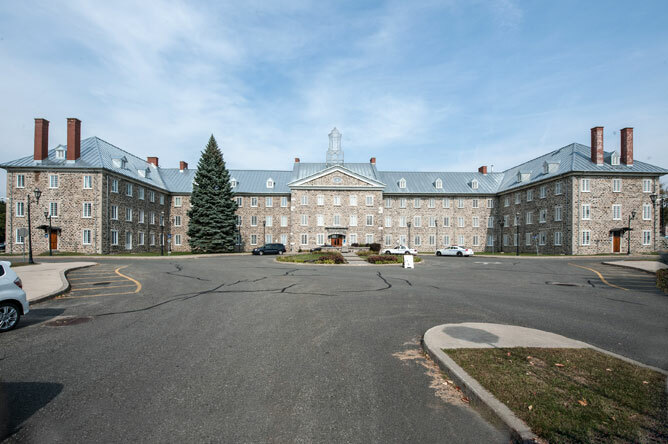 Founded in 1803, the Nicolet Seminary was the third most prominent classical educational institution in the province, after the Quebec City and Montreal seminaries. 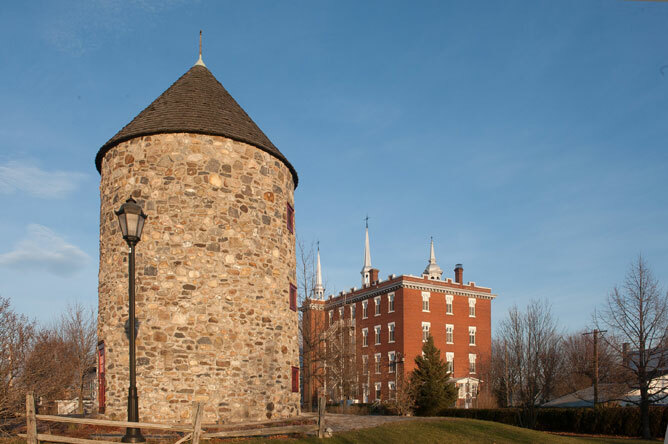 Construction of a second, larger building to replace the original one began in 1827. By 1831, courses were being offered in the new building. 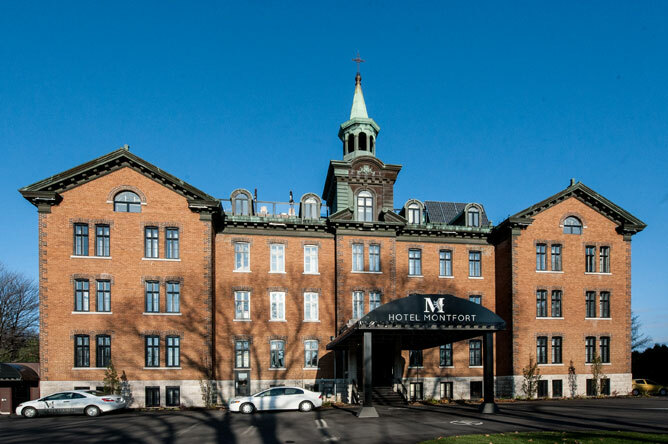 In 1969, the building was sold to the Government of Quebec. 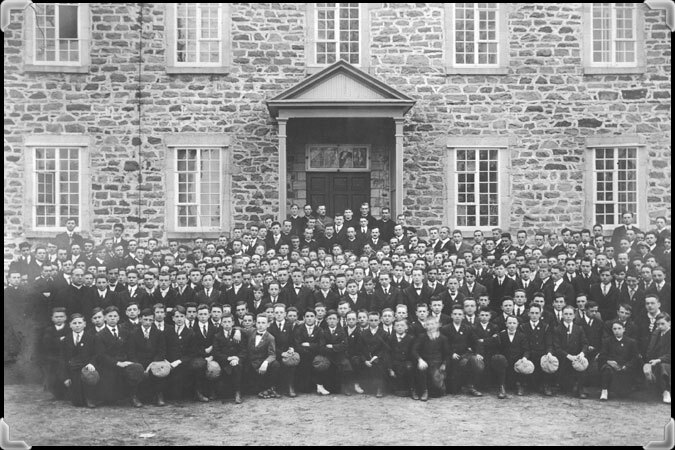 Since then, it has housed the Institut de police du Québec, now known as the École nationale de police du Québec, a training academy for police officers. The Nicolet Seminary was recognized as a historic site in 2012. The Nicolet Seminary has had many illustrious graduates. Abbott Léon Provancher, Canada's greatest botanist, attended the school from 1834 to 1840, then returned to teach at the Seminary. In 1868, this eminent botanist and entomologist founded Le naturaliste canadien, the first French-language scientific periodical published in the Americas. Journalist, lawyer, civil servant and writer Antoine Gérin-Lajoie (1824-1882) also studied at the Seminary from 1837 to 1844. Poet, playwright, writer and politician Louis-Honoré Fréchette (1839-1908) completed part of his education at the school between 1854 and 1860. Regional poet and rural physician Nérée Beauchemin (1850-1931) completed his classical studies here from 1863 to 1870. 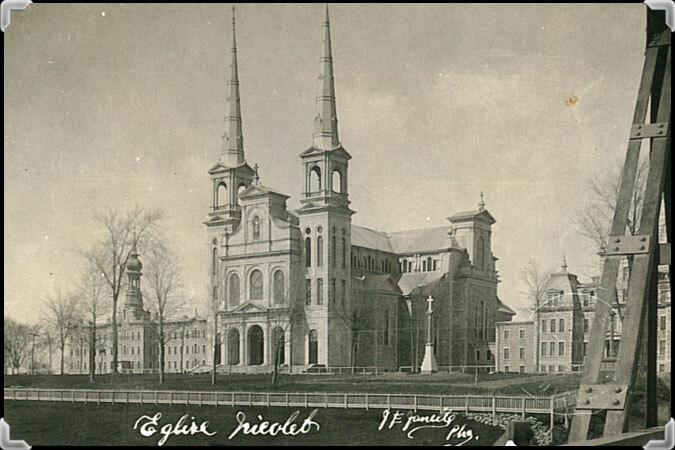 This postcard shows the fourth cathedral in Nicolet, which was built in 1910 and demolished in 1956 following the landslide of 1955. On November 12, 1955 at 11:50 a.m., a major landslide carrying 160,000 m3 of earth crashed into Nicolet, splitting the town in two. The majestic pines that graced the park were swept away. 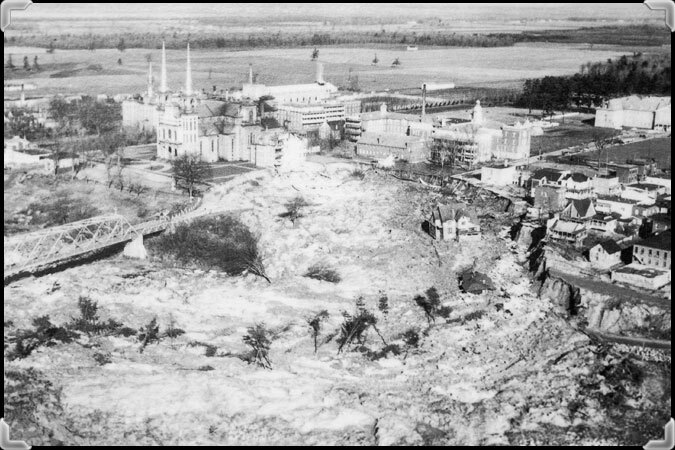 Part of the bishop's palace, the trade school, a service station and many homes were also swallowed up by the clay. Three people lost their lives in this disaster: a brother of the Christian schools, the cook of the trade school and a baby. In addition to these deaths and several injuries, the landslide caused around $10 million in damage in barely ten minutes. It is now believed that the landslide was partly caused by work being done near the river to prepare for the construction of a boulevard. Unfortunately, the unstable clay of the riverbank quickly transformed into liquid mud, triggering the landslide. The year 1955 was very eventful for the people of Nicolet. 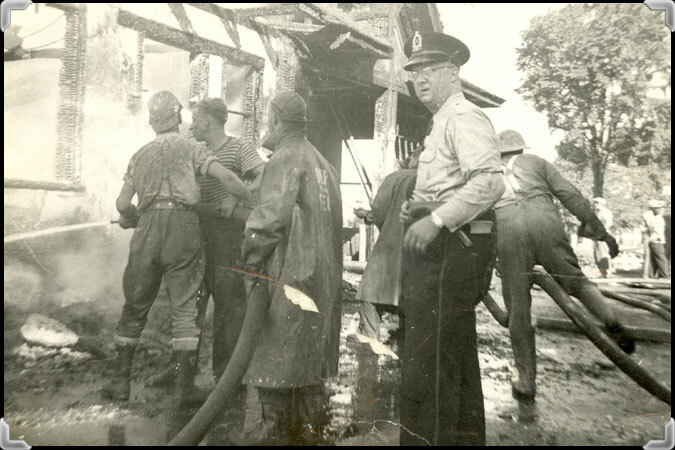 On March 21, 35 buildings were destroyed by a large fire, which caused $1 million in damage and left 75 people homeless. 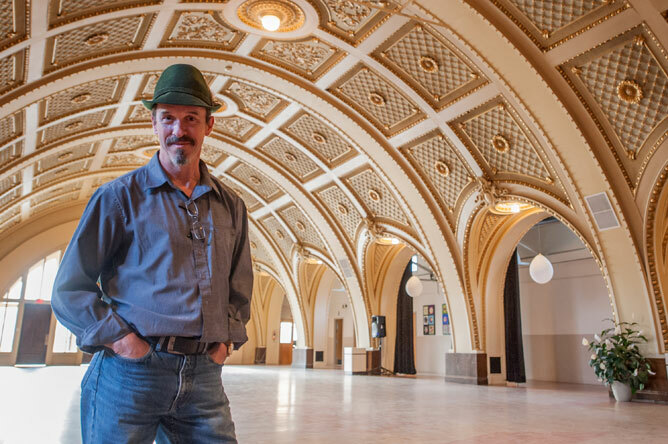 Bernard Brochu, director of the Centre des arts populaires de Nicolet, warmly welcomes visitors beneath the richly decorated vault of the main hall. This community centre provides rooms that can be used for a variety of community needs. 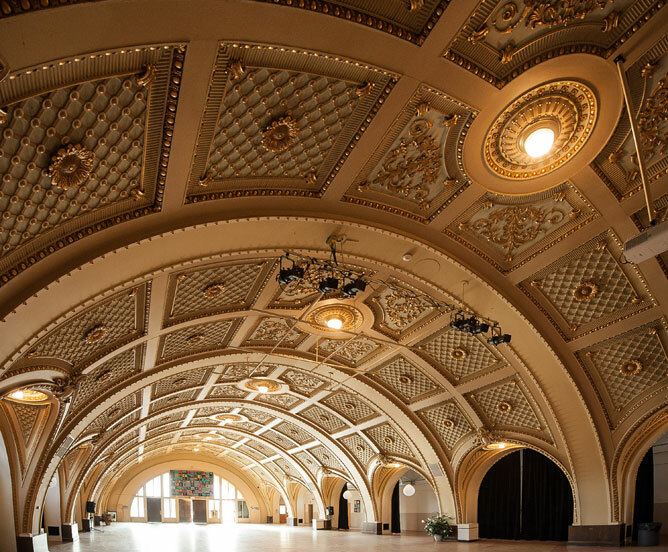 Shows and exhibitions are presented in the main hall, and some 20 other rooms are used for group meetings and courses. 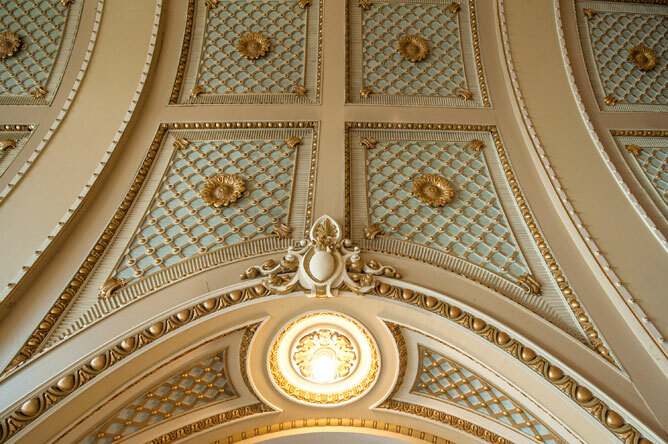 The ornate vault of the main hall, covered in gold leaf and flower designs, was originally from the fourth Nicolet Cathedral, which was destroyed by the landslide of November 12, 1955. After that tragic event, the cathedral was demolished because it was feared that it would collapse. 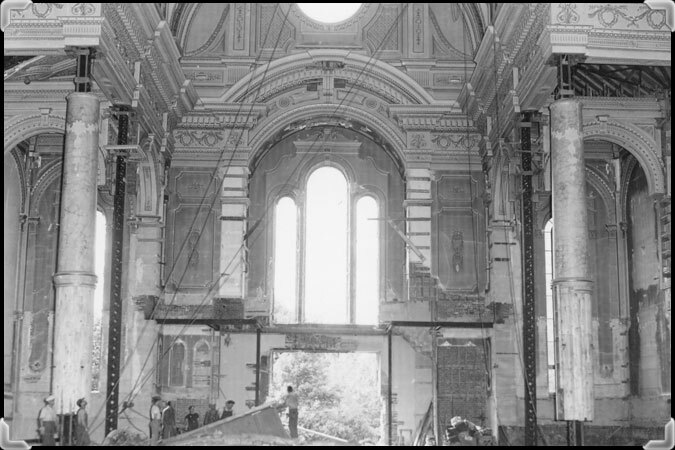 The vault was carefully taken apart and put back together as part of a new building, the Catholic Centre, on Boulevard Louis-Fréchette. This Centre served as a house of worship from 1956 until the fifth cathedral opened in 1963. Because the bishop's palace and the school were also destroyed by the landslide, the Catholic Centre included offices and classrooms. Poet, playwright, writer and politician Louis-Honoré Fréchette (1839-1908) studied at the Nicolet Seminary in the mid-19th century. The Centre des arts populaires is located on a street named in his honour. The tide expired in silence. This house, built on high ground just outside the area flattened by the landslide that hit Nicolet on November 12, 1955, barely escaped the disaster. Today, the area where the ground collapsed has become Marguerite-D'Youville Park. The Rue du 12-Novembre running along the park was named in memory of the tragic incident. 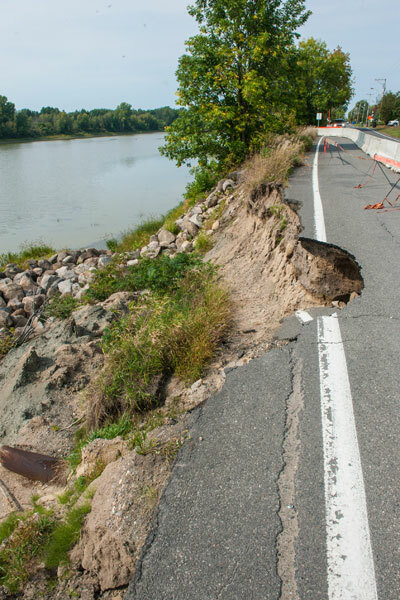 On June 13, 2012, a 30-metre section of the bank collapsed near Rang du Bas-de-la-Rivière in Nicolet. This was probably just a slump due to erosion rather than a true landslide like the 1955 event. The people of Nicolet still retain the painful memory of this catastrophe, which was a defining moment in the town's history.